We felt it was a great event not only for Spirit employees to see new and exciting technology, but also executives to begin thinking about workplace charging opportunities at the Wichita facility. The CFO of Spirit was generous enough to display his personal Tesla Model S. We also had a 1918 Detroit Electric on display which is owned by another Wichita native. Central Kansas Clean Cities felt that this event was a huge success for EV consumer education and an important step to implementing workplace charging in the region. We could not have had such a successful event without the help of Spirit Aerosystems, McGavock Nissan, Eddy's Chevy, Rusty Eck Ford, BYD, and Westar Energy. Things are about to get electric this year at Spirit’s 10 year Open House Event! 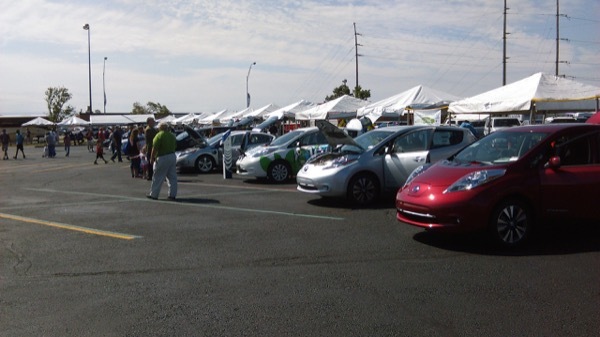 In support of National Drive Electric Week, electric vehicles from automobile manufacturers Nissan, General Motors, Ford, and BYD will be on display showcasing their latest technologies and the great innovations EV’s have to offer. This event is open to Spirit employees and their families only. The Spirit Aerosystems’ 10 Year Open House Event is Sunday, September 20th in the K-Lot located near the intersection of South Oliver and MacArthur Street. Registered attendees report 6,000 electric miles driven.